The park area comprising almost two hectares is located in close proximity to the Panmure township and, known as the Ireland Road Domain, was placed under the control of the Mt Wellington Domain Board in 1902. Many of the roads and streets around Panmure are named after the first Board members such as Edward Pilkington and Barton Ireland. Sports days, rodeos and carnivals were examples of early athletic activities that were organised on the park. 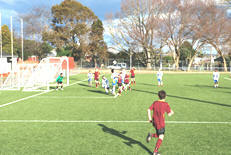 On the land at that time was a small pavilion with a changing room which became the Mt Wellington Association Football Club’s first clubrooms. In 1954, however, the unexpected decision by the Domain Board changed the club history forever. The Board members, by this time nearly all Mt Wellington Borough Councillors as well, were unhappy with a perceived lack of commitment by the rugby club to playing on the Domain during the weekend. At the same time, and obviously impressed by the efforts of the fledgling football club, the Domain Board decided to allot use of the Domain exclusively to Mt Wellington AFC. Some time later, after foiling an attempt to take over by bussing in an entire evening shift of a local industry to support them, Board members decided they could be again vulnerable in the future. They wound up the Board and passed their assets, the football ground and the mountain, over to the Mt Wellington Borough Council. With increased membership numbers and the need to provide better facilities, the club drew up plans for new clubrooms in 1961. This project was carried out in three stages; the changing rooms and toilet block, the small upstairs lounge and finally, the main clubrooms which were finished by 1968. In the early part of 1976, the club was shocked by the unexpected death of Bill and Joe McKinlay. For almost fourteen years, the two brothers had faithfully served the club in various capacities. To honour Bill’s commitment to football, the Club asked Mt Wellington Borough Council to rename the Ireland Road Domain to Bill McKinlay Park. 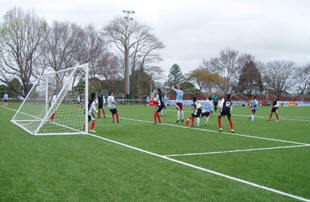 In 1999, Mt Wellington Association Football Club merged with the University Football Club which was based at Colin Maiden Park at Merton Road, Glen Innes, to form the University-Mount Wellington AFC (“Unimount”). 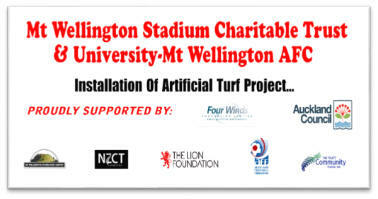 Both parties benefited from this merger; Mt Wellington gained access to quality playing areas and University gained the benefit of a stable administration to ensure the needs of their teams were met. For many years, the playing field was maintained by the club and it was kept in good order, considering there is only natural drainage. However, increased playing numbers and the absence of a dedicated training area took their toll and the ground started to deteriorate. Consequently, the ground and adjoining facilities, including floodlights, could not be used to maximum capacity. 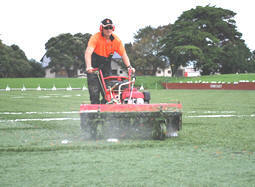 In 2004, the former Auckland City Council commissioned Dr Richard Gibbs to report on the options for upgrading the playing surface of Bill McKinlay Park. In his report, he advised not only was there significant under-utilisation of facilities, the current surface would not be able to cope with any increase in usage. 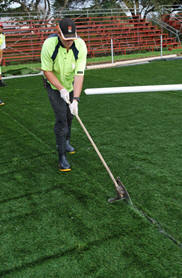 Of all the options he presented, the installation of synthetic turf was considered potentially the most cost-effective upgrading option. 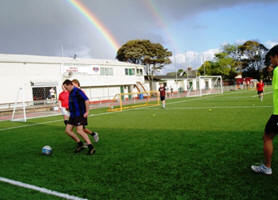 Four people – Barbara Cox, Harry Dods, Bob Douglas and David Mairs – met later that year and formed the fledging Mt Wellington Stadium Charitable Trust (“Trust”) in order to investigate the possibilities of developing Bill McKinlay Park into a regional, multi-use, mini- stadium with an all-weather pitch for the footballing community and local residents. The Trust was registered in 2006 as an Incorporated Society (1898339) and in 2008 with the Charities Commission (CC28041). The trustees put in a tremendous amount of voluntary work over the next seven years, presenting proposals to Council staff and local community boards as well as entering into discussion with local politicians and charitable trust members. 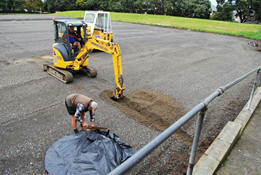 Finally, in September 2010, a Facility Partnership grant of $500,000.00 was approved for the Trust to enable the construction of an all-weather artificial playing surface at Bill McKinlay Park. Within football history, Bill McKinlay Park has been the home of many memorable occasions, not least the match between New Zealand and Mexico in August, 1980. Over 5000 spectators crammed into the park to witness a stunning 4-0 victory to New Zealand. Not only did the result rock the South American footballing world, many fans believed it signalled New Zealand’s first attendance at the FIFA World Cup – Spain ’82. During the 1970s and 1980s when Mt Wellington AFC played in the National League or contested Chatham Cup finals, fans flocked to support what was arguably the strongest club in the country. 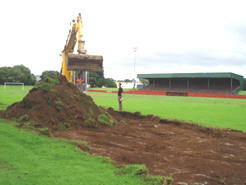 The installation process started with the removal of the layer of grassed turf and the fixed goalposts. 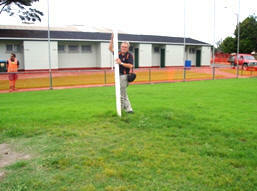 Below on the left is Ron Armstrong, marketing manager of Tiger Turf and life member of Unimount about to remove the goalposts. The picture on the right shows Ross Galloway, operations manager for Tiger Turf, checking out the progress with an employee from Earthco Civil Ltd who were subcontracted to excavate and prepare the base work. 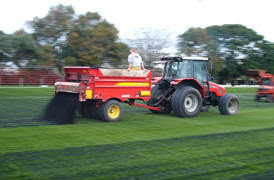 On average, 200 mls of grass and topsoil were removed before the base materials were placed on the ground. This base material consisted of a first layer of Gap 40 followed by a second layer of Gap 20. 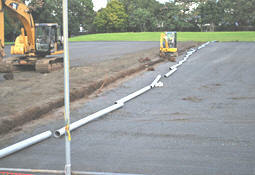 The next step was to lay the drains to take away the rainwater from the playing field. Sometimes, the subsoil drains are laid before the subgrade base goes down but, as winter was approaching, the decision was made to have the gravel down first so that the trucks could move over the field, unhampered by muddy conditions. 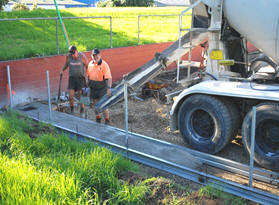 The perimeter kerbing needs to be in place prior to the levelling of the base materials. The transmitting laser device set up by the dressing sheds is used to set and establish the levels of the kerbing. 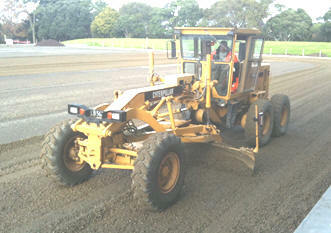 The small device, which you see in the photograph below attached to the yellow pipe on the grader, is a laser receiver. Its function is to create the raising and lowering of the grader blade in accordance with the correct levels set by the laser transmitter. 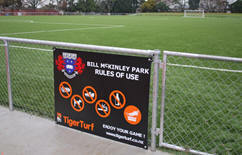 The product installed on Bill McKinlay Park is Soccer Real 60 MS which was manufactured from synthetic monofilament yarns designed for stability and long-term wear, and tested to FIFA 2 Star standards. The Ten Cate yarn came from the United Arab Emirates and then, in Tiger Turf’s factory in Onehunga, was tufted and bonded with a uniquely formulated latex backing to last the wet winters that Auckland continually has. No more marking lines by hand or machine! A roll plan is drawn up of the field. 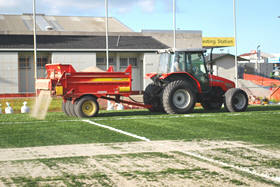 Each roll of synthetic turf is numbered, positioned on the field, according to the roll plan, and then rolled out with a tractor. 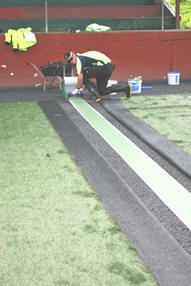 The edges of each roll of synthetic turf is peeled back and, in the photo below left, you see Adam Cherrie, a former Three Kings midget player, placing the tape down ready for the next step. Using wet weather glue on the tape, the edges are then kicked onto the tape before a special device butts the two rolls neatly together. Now to the last steps of lifting the turf and infilling it first with sand and then with rubber granules before the final quality checks take place. 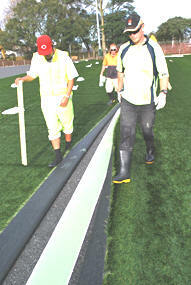 While the dimensions of the football field are 104 x 68 metres, the total area covered in synthetic turf is 114 x 74 metres. 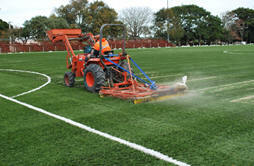 On 9 June 2011, three Unimount teams had their first games on the newly finished surface. No more cancellations from bad weather and no more mud destroying the flow of the game. As one player remarked with surprise, “it is the first time ever that my boots were clean at the end of a game!” While Unimount teams received priority to play games during the weekend and for Wednesday night trainings, any spare time was quickly booked by neighbouring football clubs. Touch Rugby, Ultimate Frisbee and 5-a-side football competitions soon followed as well. As an acknowledgement of our gratitude to those organisations who shared our vision and enabled the installation of synthetic turf to become a reality, a permanent reminder is mounted on the wall next to the entrance to the park. 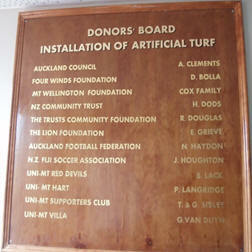 Inside the clubrooms, a donor’s board has also been installed to record those same organisations plus individuals and Unimount teams who donated financially to this project. While Trust personnel remove any debris from the park twice weekly, City Parks carry out weekly brushing with their specially imported machinery to ensure uniformity of the surface and a revitalisation of the infill. Each month, a vertitop vac machine filters the debris, which may include human hair, leaves and stones, from the top infill layer via a vibrating mechanism. 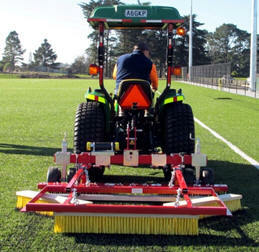 The cleaned infill is then re-distributed and a rear brush ensures a smooth finished surface. 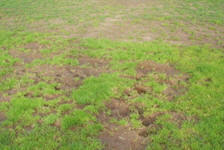 Once a month also, stains and any weeds, algae and moss are removed.